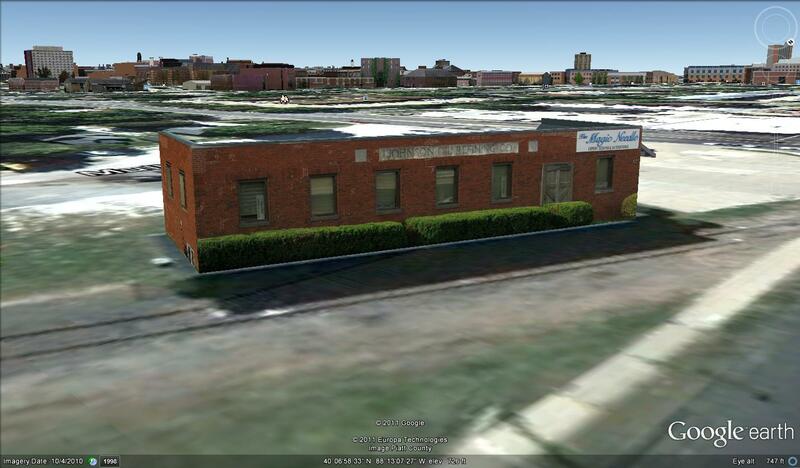 Until yesterday, I hadn’t uploaded a building model to Google’s 3D Warehouse since 11 March of this year. I couldn’t quite recall when I created my first 3D model, but my blog reminded me that it was in July of 2009. I have several models in various states of construction. Some of them will require more photography. Some others will require that I simply spend more time working on them. My attention span and concentration have suffered a bit during the past eighteen months. I’ll blame a large part of that on chemo brain. Some people have been a bit confused about an aspect of the 3D models I create for Google Earth. Creating these models is a hobby for me. I’m not an employee of Google’s, and I don’t get paid for this work. Anyone with the right tools can do this. The building at 811/813 West University Avenue, in Urbana, Illinois, used to house a local office of the Johnson Oil Refining Company. The photographs shown below were taken in September of 2009, specifically for use in creating a model. If you wish to take photos of a building to create a 3D model using Google’s Sketchup program, I would suggest taking more than the small number shown here. Having a wider variety of views, and at least a single view of every distinct face of the building, is the best first step to take. After being uploaded to Google’s 3D Warehouse, models are reviewed by Google, and can be accepted as part of their 3D buildings layer in Google Earth. One hundred one of my models have so far met the acceptance criteria for Google Earth. I suppose I should take a look at the many other models I have in progress, and see which one I should finish next.